ShockStrap brand of tie-downs addresses this concern head on with an ingenious design that incorporates a secondary urethane elastomer placed in line with the strap that is stretched as you tighten and secure your cargo in place. Key to its design is the dynamic attributes of the urethane elastomer. When tensioned it effectively becomes a spring and damper – all in one. Most states in our great country don’t allow us to drive our awesome dirt toys on the streets. That means a lot of hauling is required, which also means tie-downs are involved. We’ve tried many different types of tie-downs with varying results. Dirt and mud can clog up ratcheting systems, as some straps aren’t weather-resistant, so their material becomes hardened and difficult to use, and oftentimes we run into issues where straps become loose while traveling. We had the good fortune of running across ShockStrap. They have a unique design that helps their tie-downs keep constant tension while holding down our machines. If you are hauling expensive equipment or gear protecting your investment with a cheap strap can cost you thousands of dollars if they fail. 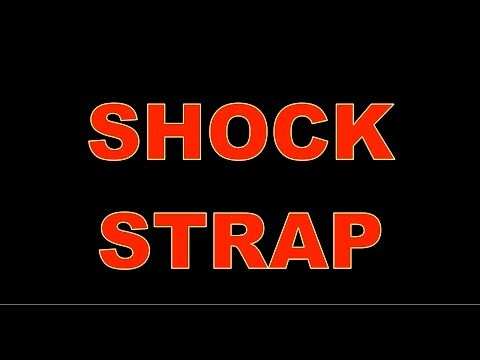 ShockStrap revolutionized tie downs with the introduction a few years back of their high quality tension straps that were thicker and made of polyester strapping instead of nylon. This polyester is mold, mildew, and rot resistant; has a higher working load; and stretches and frays less that nylon. This year, ShockStrap finalized two years of R&D to release their new ratcheting strap. Featuring the same shock absorbing technology to keep the strap under constant tension. 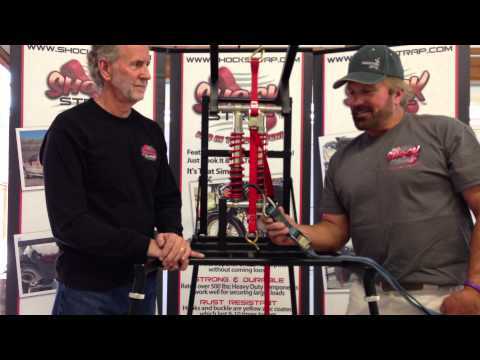 The Shocks-Straps are resistant to UV rays, oils, salt, and corrosion. We’ve all been there. Bouncing down an old dirt road with half the garage stacked in the bed of the truck, trailer or whatever mobile storage facility we have in our arsenal. We’d make an engineer proud. We Stop every 10 minutes enroute to our secret hunting spot to make sure our valuable gear (and more importantly – our mastery of engineering) stays intact. Which brings us to straps – tangled, finger-pinching, knuckle-tearing straps – and those are the good ones! The bad ones, well, they just fall loose on the bump of the gutter between the drive-way and the road. Then they flap wildly and bang conveniently in the wind to let you know you need to stop and attent to their needs. Do you load your motorcycle on a trailer or truck bed? I often do, especially the dirt bikes, and it’s an exercise that always puts knots in my stomach. It’s not a tough thing to do, rather it’s just that any bump I hit can make the bike move around quite alarmingly. That’s because when I tie my bike down, I use a variety of Nylon straps (in which there is very little give) to tie the bike to the trailer bed (in which there is very little give). The only moving part in the mix is the motorcycle suspension. The idea is that when you tie the bike down, the suspension should soak up the bumps you hit on the road, but it never quite does. Motorcycle suspension is generally damped so that it doesn’t keep bouncing, that means the suspension can’t react as quickly as it needs to. The net result is that your bike can unhook from its anchor point, which really doesn’t bear thinking about. You can see how shock absorption might work in the Sock Strap video below. ShockStraps are a unique shock absorbing tie down that incorporates three of the most versatile tie down principals into one superior system. It is quick and easy like a motorcycle tie down, has the reliability of a ratchet system and versatility of a shock cord. Good afternoon, today’s product review is for the Shock Strap tie down straps. Their claim is that their Shock Straps are superior to regular tie down straps because they provide shock absorption while keeping your load secure. This keeps the Shock Straps from loosening up while hauling your outdoor “toys”. As we all know, when hauling your ATV, motorcycle, snowmobile or towing your small fishing boat, the tie down straps will sometimes come loose. Not only can this become an expensive problem but also a dangerous one. With Shock Strap tie down straps this problem is solved. Straps, or tie-downs, are all the same, right? Most would agree that that statement is fairly broad and that not all tie-downs are the same. We admit we used to think most tie downs or straps were all basically the same. Really, how many differences can there be? Then we tried ShockStraps. Revolutionary might be a bit strong in describing the ShockStrap, but we will say it works very well and its design does separate it from the others. Every once in a while a product comes along that makes you ask, “Now why didn’t I think of that? !” ShockStraps are these types of products. I’ve hauled ATVs and heavy equipment for years and I appreciate when a load is strapped down the way it should be to eliminate shifting and possible accidents. These simple straps are amazingly effective at keeping your load secure. A perpetual problem with true ratchet straps is that when your ATV is bouncing around on your trailer or in the back of the truck, they tend to loosen up and allow the ATV to shift during transport.